The mammological collection of Samarkand Museum of Local History is part of the zoological collection of Samarkand Regional Museum of Local History. As in the ornithological collection, most specimens in this collection were made by A.N. Bogdanov (1927, 1938-1941, 1948, 1954, 1963) and P.F. Rypl (1927-1938) during their studies in the vicinity of Samarkand (tugai forests of the River Zarafshan and the Karadarya, canals Siab and Dargom, Zadargom steppe, Khodja-Akhrar, Cheka, Miran-Kul, Sazagan), the vicinities of Katta-Kurgan, steppe Karnabchul, Khodja-Davlet, kara-Kul, Lake Iskander-Kul, Zarafshan Ridge, and the vicinities of Shirabad. 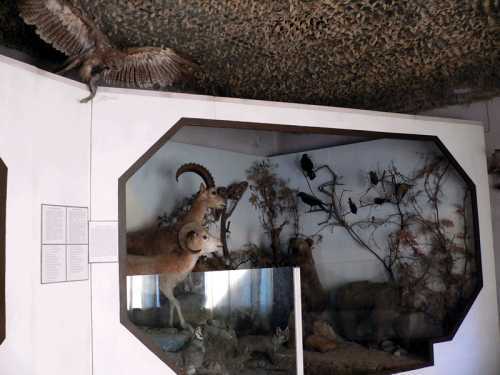 The specimens of the mammological collection in Samarkand Museum of Local History include 97 stuffed animals (more than half of exhibits), skins, horns and skulls. 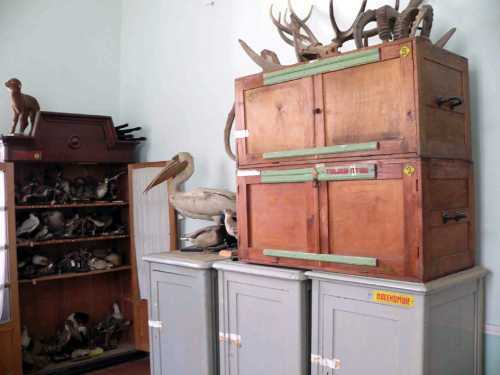 Similarly to the ornithological collection, 49 mammalian specimens of this museum (mainly stuffed animals) were presented to other museums or written off as outwear. However, data on these specimens kept in the inventory registers were entered into the electronic database. Thus, the electronic database of the mammological collection of this museum contains information on 146 specimens. The fund and the database of the mammological collection of Samarkand Museum of Local History include 146 specimens of mammalians belonging to 46 species of 16 families of 6 orders (42.9% of the entire species diversity of mammalians in Uzbekistan. Despite a rather low number of specimens, Carnivora (14 out of 25 spp.) and Artiodactyla (8out of 10 spp.) are well represented in it; Rodentia are represented to a smaller degree (16 out of 43 spp.). Mammological collections are most numerous and diverse from the middle and lower courses of the River Zarafshan (41.0% of the entire collection), which are comprised of 26 species of 6 orders, and from the Pamirs-Alai (30.1% of all specimens) including 22 species of 5 orders. Sole specimens were collected from six regions, namely, the Amudarya, the Kyzylkum, the Kashkadarya, Tashkent province plain lands, western Tien Shan and the Ferghana Valley. Geographically unidentified remain 21.9% of the total number of specimens. The largest part of the mammological collection is comprised of skulls in the exhibitions of this museum. The skulls are kept on the shelves, while skins in wooden collection drawers in the collection room. All the specimens are labeled.